black | More blue fabric? 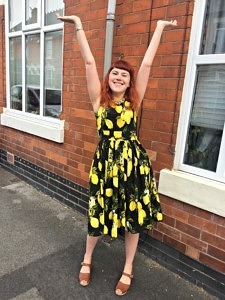 I’m not sure what it is about lemons, but for a really, really, long time I’ve been after a dress covered in lemons. Specifically, non-cartoon style lemons on a black background. 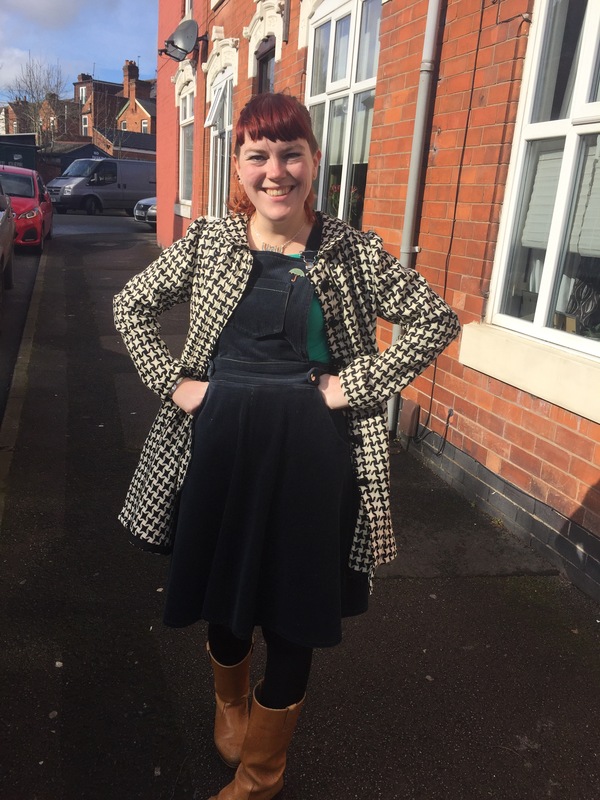 Last summer a friend had a pair of trousers in exactly the right print from H&M, and although I did rummage the racks, they hadn’t thought to make it into a dress (fools!). Then, towards the end of June, I discovered that Meg had managed to source the perfect fabric that I was after and was selling it on her Etsy shop. Fast as a flash the fabric was ordered, and almost as speedily Meg got it out to me. I had a pile of possible makes as long as my arm but it was no good; as soon as it arrived I had it washed and, the next free day I had, I began to make the dress, because when life hands you lemons, the obvious thing to do is make lemonade. Everyone has the little thing that they do when they want to feel more confident, and whilst I can’t speak for you, for me it’s almost always to grab the lipstick. Whether it’s the subtle pink that I grab when I’m working from home to make me feel more grounded and ready to smash my deadlines, or the rich plum that feels vaguely gothic, there’s something very present making about the act of putting on lipstick. Red lipstick is the absolute king of all of these, a bold bright colour that makes me feel ready for anything from date nights with the boy through to the most difficult of difficult meetings. When it came round to deciding on the dress that I wanted to make to wear on a trip to Lasan for the boy’s birthday, I stumbled across this fabric in my stash and realised that its time had come. I shall (probably) go to the ball! 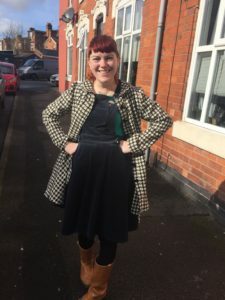 Over the last few weeks, there’s been a lot of excitement around the Dressmaker’s Ball, an event that’s being hosted by Crafty Sew & So in Leicester on 12 May. 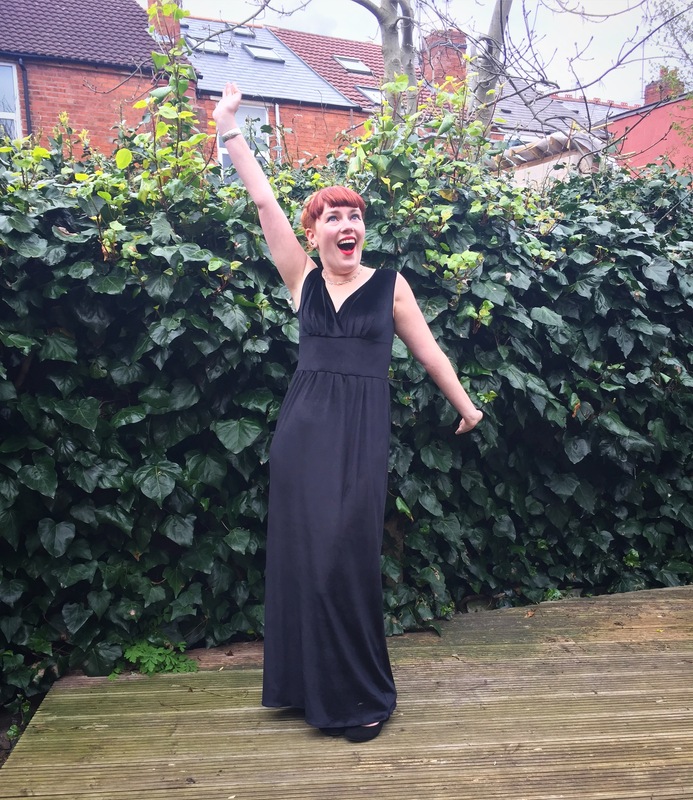 Over at the Simple Sew blog team this excitement has culminated in a month of party dresses made from Simple Sew patterns. 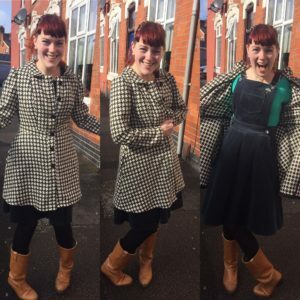 When it was time for me to pick a pattern, I knew I wanted something that could be turned quite easily from a day to day staple into something that shouted red carpet (although not literally, of course!) and I think I found it. Back when I went fabric shopping in Hong Kong with Vicki one of the things I absolutely fell in love with was a woven monochrome wool, a bit like houndstooth but more like stars (or at least, more like stars in my eyes). I knew as soon as I saw it that I wanted to turn it into a coat, and found myself stood with Vicki in the baking heat trying to figure out how much material I’d need for a winter coat (a very strange experience I must say). I settled on three metres, but, when I got home and remeasured the fabric, I discovered a fatal flaw in my plan; I might have been talking in metres but the shop owner was definitely listening in yards! That left me with 2.7 m of fabric – not a shabby amount but not quite as much to play with. Then I started looking for the perfect pattern. I found it, it was glorious. It needs a minimum of five metres of fabric. So back in December, my friend Jenny asked me if I’d be able to help her out with something rather exciting. She makes music under the name Rooks (and go check it out, because it’s amazing) and wanted to do something a bit different for her album launch in March. Namely, lights. 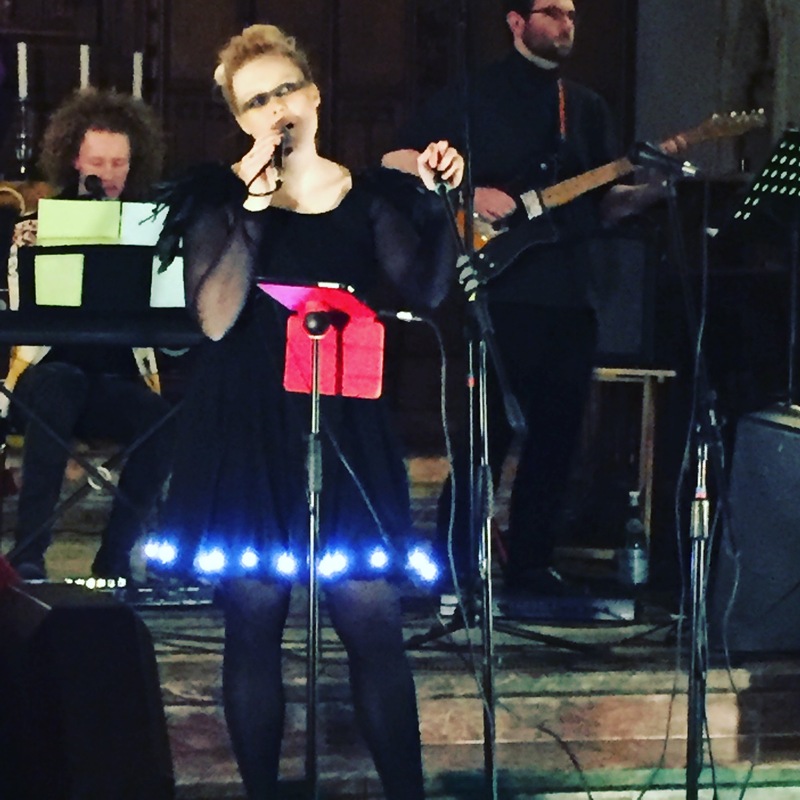 So of course I agreed, because, frankly, when offered the opportunity to make a dress with lights in it, who’d say no? A sleeveless shift dress. With lights. You heard me. Lights. What’s the fabric and where is it from? Black crepe from the indoor market at the Bullring. The bodice was lined with a black and white bird print cotton bought in Walthamstow. 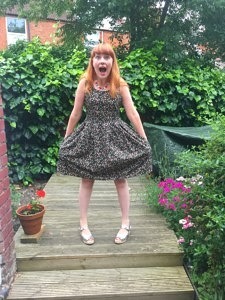 An altered version of the Lilou dress from Love at First Stitch. I learnt that black fabric is not particularly interesting to sew with. I also found it really stressful to make something for someone else; as much as I worry about the fit when I make things for myself, I know that ultimately I can bodge it around myself. Not the case here by a long shot! It depends if I’m asked! I have a search. A search for the perfect shirt dress. As an item of clothing I blooming love them but as a thing to make I’d felt pretty daunted by it as a possibility. I’m going to say right now that this dress is not the perfect shirt dress. 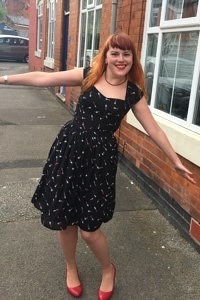 In fact, this dress very nearly got consigned to the WIP pile for all eternity and even once complete it very nearly caused a meltdown and immediate binning. But more of that when we get there, for now…. 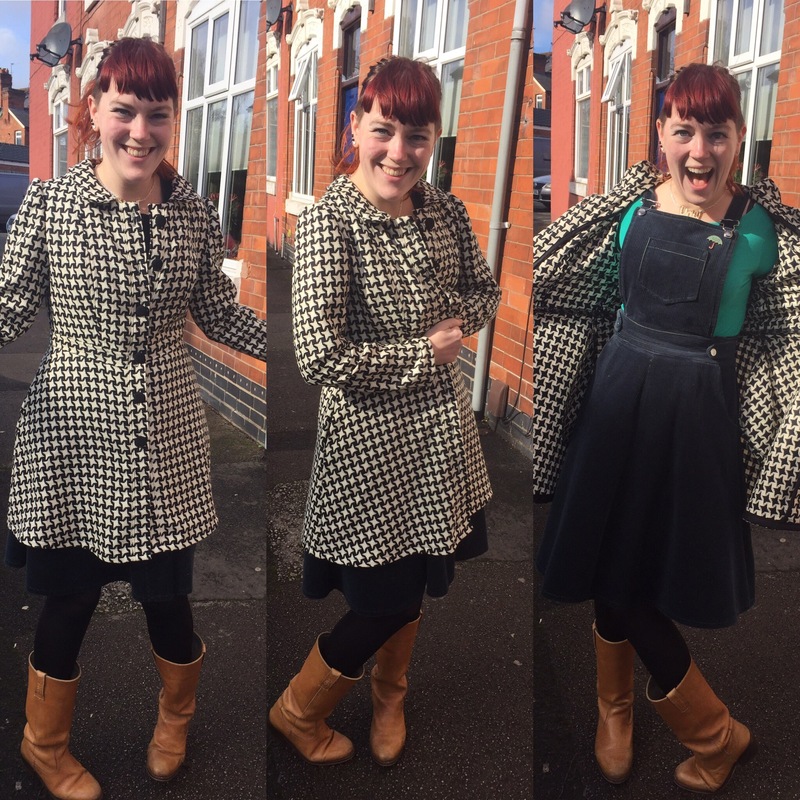 I got it at the Birmingham Rag Market during SewBrum for the princely price of £1 per metre! Where to start? With the collar piece that I cut to the wrong size because the schematic diagram for the layout wasn’t particularly clear? The confusion around finishing the facing? 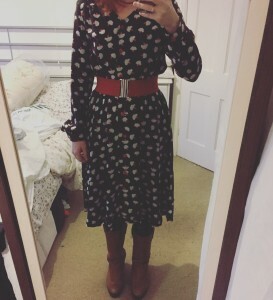 It doesn’t help that I got so far with making it and then ran out of time before Christmas, so left it unhemmed and unbuttonholed (?) for about a month. 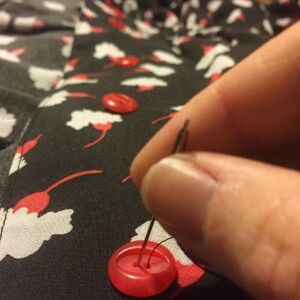 By which time I was fed up of it and bored, a feeling repeated when I hand sewed on the buttons (whodathunk a shirt dress would have lots of buttons….). The absolute moment of (near) tears though was when, having finished it, I tried it on with the belt that comes with the dress. It looked hideous. A moment of learning the hard way that I do not suit a loose bodice or fussy waistlines with extra fabric. I looked – and felt – like a giant sack of potatoes. For then I remembered my old friend the cinch belt and lo, with a bit of a nip in and reallocation of fabric folds, the dress was completely redeemed. And now I love it. So much so that I’ve worn it a couple of times already in the fortnight since making. Nope. This dress is not the dream shirt dress that I was hoping for and, whilst I’m pleased with the finished product, I think that I wouldn’t make it again. 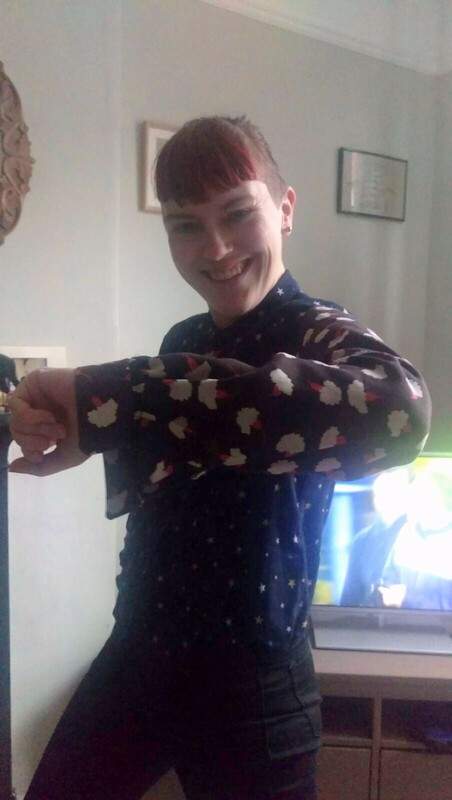 I have however found out about the fabled McCalls 6696 shirt dress that seems to be getting a lot of positive press in the blogsphere, so have bought a copy and plan on making that after my current (nearly finished) project.